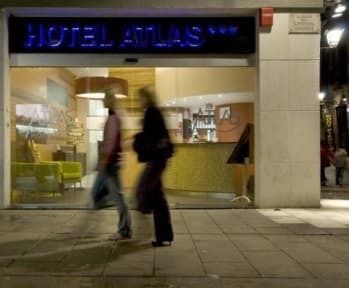 Hotel Atlas i Barcelona, Spania: Bestill nå! The Hotel has a vey modern design and decoration, and this extends to the complet technological equipment and service network that offers to customers. 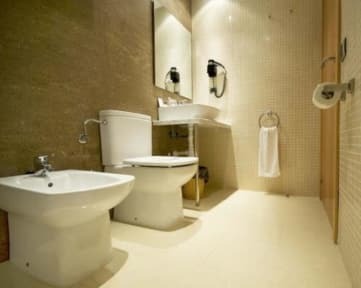 Without a doubt, one of the biggest attractions of the hotel is its ideal location. As soon as you walk out of the hostel you find yourself in the city centre. Close by, you will find all the main historical, architectural and tourist places of interest. On the Ramblas, across from the hotel, you can find the Mercat de la Boqueria which was named the best market in the world in 2006. Further down the Ramblas, you will find the Columbus monument which faces a big entertainment centre called Maremagnum. From there you can take a pleasant stroll to the beach (15 minutes from the hostel). We have a bar to the letter conditioned. At 2 metres, there is parking, for those who come with their own vehicle. In the living room we have computers with Internet connection and Wifi throughout the establishment.